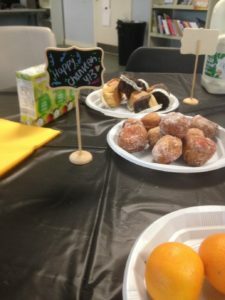 The student work room was transformed into a breakfast room and students enjoyed doughnuts, muffins, fruit and hot drinks. Mr Lewis spoke to the students and reminded them of the importance of Chanukah and its modern day messages. The event was very special and in total £100 was raised from student donations to Tzedaka.